Morro Bay, CA IPT. APR 2-4, 2012. 3-DAYS: $1499. Introductory Slide program: 7pm on 4/1–no fooling! Limit: 10. Shorebirds including Long-billed Curlew; gulls, sunrises and sunsets, California poppies, and more. As I walked along the beach there were Long-billed Curlews to the left of me and Long-billed Curlews to the right of me. Some were feeding along the edge of the surf, some were sleeping peacefully higher up on the beach, and others were squabbling over the sand crabs they had just captured. As this is a difficult species to photograph over most of its range, it was like being in shorebird photographer’s heaven. In the spring of 2008 I did a workshop for LIDI (formerly the Lepp Institute and now Light Photographic Workshops) in Los Osos, California. Just 15 minutes to the north via South Bay Blvd, State Park Road, and Main Street you will find spectacular Morro Bay, Morro Bay State Park, and the stately Morro Rock. If you love shorebirds as I do, you will want to visit in fall, winter, or spring. If you love flower photography visit in spring when fields of blooming California poppies await in most years. 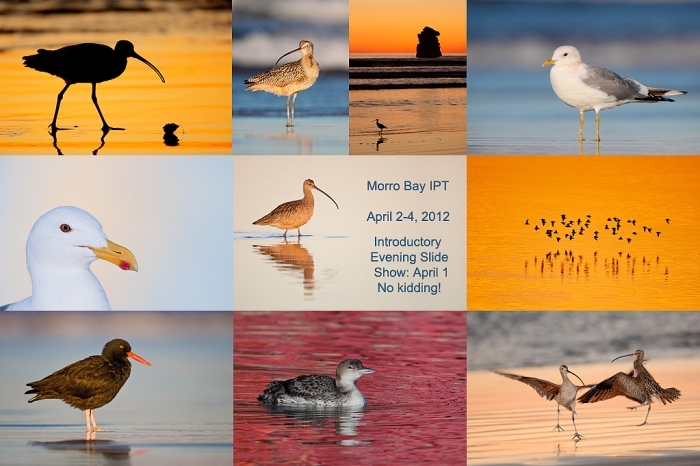 Do consider joining me and Aidan Briggs for three days of great bird and nature photography on the Morro Bay IPT. In addition to getting to photograph a variety of shorebirds including Long-billed Curlew, Marbled Godwit, Black Oystercatcher, Surfbird, and large flocks of peeps we will have good chances with a variety of gulls and enjoy some spectacular sunrise and sunset colors. California Poppy should be in bloom and we may even get our lenses on some landbird species including White-crowned Sparrow, Western Scrub Jay, and Anna’s Hummingbird. Also possible are Common Loon, a variety of ducks, Brandt’s Cormorant, and a heron rookery. A minimum focal length of 500mm is recommended for this trip (though Aidan has created 100s of great images there with “just” the Canon 100-400mm IS L zoom lens. I do hope that you can join us for this great Instructional Photo-Tour which will take place immediately after the Morro Bay Photo Expo. Details on that will be announced at the end of the year. You can see lots more images from my first Morro Bay trip here. Click here for the current BAA IPT Schedule. Great pix from Morrow bay! We just got back from there (to Maine). We saw Long Billed Curlews, very tame Pelicans, Harbor Seals, Sea Otters and even some crazy surfers.